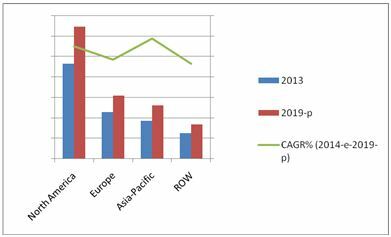 The report “Protein Hydrolysis Enzymes Market by Sources (Microorganisms, Animals, Plants), Applications (Detergent Industry, Pharmaceuticals, Food Industry and Others), & Geography (North America, Europe, Asia-Pacific & ROW) - Global Trends & Forecasts to 2019” defines and segments the global protease enzymes market with an analysis of the market value by sources and applications of protease enzymes. The report also identifies driving and restraining factors of the global market with an analysis of trends, opportunities, winning imperatives, and challenges. Browse more than 98 market data tables with 31 figures spread through 236 pages and in-depth TOC on "Protein Hydrolysis Enzymes Market by Sources (Microorganisms, Animals, Plants), Applications (Detergent Industry, Pharmaceuticals, Food Industry and Others), & Geography (North America, Europe, Asia-Pacific & ROW) - Global Trends & Forecasts to 2019"
The market is segmented and values are forecasted on the basis of major regions, such as North America, Europe, Asia-Pacific (APAC), and Rest of the World (ROW). Key countries are covered and forecasted for each region. Further, the market is segmented on the basis of application and source. Proteases are a single class of enzymes which occupy a pivotal position with respect to their applications in both physiological and commercial fields. Protease enzymes are used in a large variety of applications, mainly in the detergent and pharmaceutical industries followed by the food industry. In view of the recent trend of developing environmentally friendly technologies, proteases are envisaged to have extensive applications in leather treatment and in several bioremediation processes. The worldwide requirement of enzymes for individual applications varies considerably. Proteases that are used in the food and detergent industries are prepared in bulk quantities and used as crude preparations, whereas those that are used in the pharmaceutical industry are produced in small amounts but require extensive purification before they can be used. Technical enzymes for detergent, paper & pulp, and textile manufacturing have the largest segment with approximately 52% market share with the largest share of the enzymes market held by alkaline proteases. The global protease enzymes market is growing at a CAGR of 5.3% from 2014 to 2019, out of which the detergent and cleaning industry accounts for the major share and it is growing at a CAGR of 5.6%. Few regions like North America and Western Europe have almost reached the maturity with regard to the protease enzymes detergent market due to which the trend in usage of the proteases is shifting towards pharmaceutical industries in these regions. On the other hand, the developing countries in Asia-Pacific and Rest of the World (ROW) regions show a lot of untapped potential for the growth of protease enzymes in both detergent as well as pharmaceutical industries. The report also touches on various other important aspects of the market. It includes an analysis of the competitive landscape. In addition, key players of this market have also been profiled.